M.K. Hobson grew up in Portland, Oregon. She attended the University of Oregon, where she ran the campus film society, helped launch a radical student ‘zine, and drove night-shift cab. After graduating with a degree in English and Communications, she moved to Japan to teach English. Returning to the US two years later, she purchased The Northwest Neighbor, a Portland community newspaper which she ran for several years before moving on to a career in the field of corporate communications. Currently, she is one of the co-hosts of Podcastle. She lives in Oregon City, Oregon with her husband and daughter. Learn more at M.K. Hobson’s website. 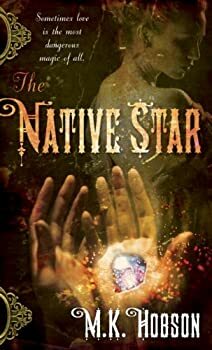 The Native Star — (2010-2015) Publisher: It’s 1876, and business is rotten for Emily Edwards, town witch of the tiny Sierra Nevada settlement of Lost Pine. With everyone buying patent magicks by mail-order, she’s faced with two equally desperate options. Starve — or use a love spell to bewitch the town’s richest lumberman into marrying her. When the love spell goes terribly wrong, Emily is forced to accept the aid of Dreadnought Stanton — a pompous and scholarly Warlock from New York — to set things right. Together, they travel from the seedy underbelly of San Francisco’s Barbary Coast, across the United States by train and biomechanical flying machine, to the highest halls of American magical power, only to find that love spells (and love) are far more complicated and dangerous than either of them could ever have imagined. The Native Staris a fantasy set in a West that never quite was: the West of tall tales, dime novels, and cheesy patent-medicine ads. M.K. Hobson realizes this mood perfectly, peoples the setting with memorable characters, and spins a compelling and well-thought-out plot. The arrival of a new issue of Lady Churchill’s Rosebud Wristlet is always an event. There is no set publishing schedule, so a subscriber is never quite sure when an issue will arrive. No. 27 landed in my mailbox just last week, full of amazing fiction. I wouldn’t be at all surprised to find a couple of these stories on awards ballots next year.